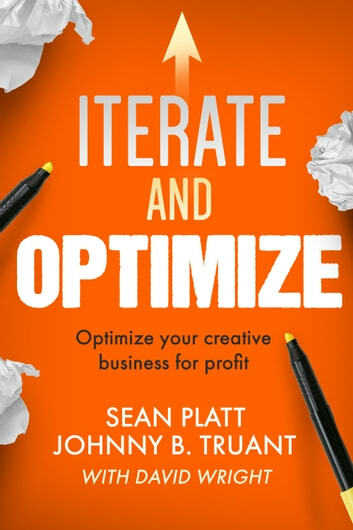 Iterate and Optimize is a behind-the-scenes peek into how indie publishing company Sterling & Stone grew their three-author team into a juggernaut — and a next-level guide for authors looking to explode their sales and do the same. In Write. Publish. Repeat., bestselling authors Johnny B. Truant, Sean Platt, and David Wright explained how to build a thriving international publishing empire with no luck required. Rather than resting on their laurels in the years since WPR was written, they’ve been evolving their once-fledgling business a little bit at a time: expanding to eight publishing imprints, ten high-profile podcasts, a coordinated staff working behind the scenes, millions of words published and hundreds of thousands of books in the hands of eager readers. In Iterate and Optimize, they show you how they grew their business from the ground up in tiny, incremental steps — and give you a road map so that you can do it, too. More than “just another self-publishing guide,” this book delves deep into the business behind the success of Platt, Truant, and Wright’s company Sterling & Stone, making it the essential “advanced course” follow up to Write. Publish. Repeat. It explains how to tweak your processes over time while maintaining momentum, wringing more profit out of assets you already have. You’ll learn how to diversify and create more products with less work, generate more money doing what you already do now, and set yourself up so you can build a readership who will support you in the specific ways you intend to evolve. You’ll learn how to grow from a bare-bones, minimum-viable-product business into a slightly larger business or an outright empire — not with massive, flashy (and risky) moves, but by the sustainable magic of incremental growth: small improvements made consistently over time. This book isn’t for the faint of heart! It’s only for serious “authorpreneurs” who’ve read and internalized the lessons of its predecessor Write. Publish. Repeat. and are ready to kick their businesses up a notch. In Iterate and Optimize, the authors hold nothing back … giving you a true insider’s look at all the details that make Sterling & Stone run. There has never been a “gold rush” or “magic button,” despite the flood of online marketers who want to convince you otherwise. But for those authors who are willing to do the work, there is a path to success. It doesn’t require luck. It only requires two things: making little improvements over time, then finding ways to get the maximum out of what you already have. Or in other words: Iterate and Optimize. Ready to get serious about your business? This is the guide you’ve been waiting for. I read the two books back to back. I am a writer and found both spoke to me with honesty, clarity and enthusiasm. Iterate and Optimize was particularly insightful, building on knowledge already gained. If you want to explore the indie road, with wisdom and a dash of humor, these books are for you. By both. They are worth your time! Talk about over-delivering! Sheesh, the boys have been busy with this one. I'll admit, I was hungry for I and O. I pre-ordered it and was counting down the days till its release and, as soon as it was available (12:01 am this morning), I download it and started tearing through the pages. Not sure what I was expecting, well, that's not true, I was expecting A LOT! And what I got was pretty f'n amazing! I think it's fair to say you should read "Write. Publish. Repeat." before this one, but I won't tell you what to do. There are 4 sections to I and O: Part 1 is about you and what you've got to offer. There are some great exercises here that I skipped right over because I was in a reading frenzy, but I'm heading back and will do the work, honest! Part 2 is all about Sterling and Stone, what they I and O'd, why they did it, and what they learned. I absolutely LOVED this section! Lots of behind the scenes stuff. You get to meet the entire team, even the man with no title, Garrett... Lol. Anyway, there's some great stuff on their writing process as well as a deep dive into everything from product funnels, social media, dealing with criticism, and so much more. This section was the most fun for me as a fan. Part 3 is pure awesome! It's all about how you, and I, can start to I and O right now! The cool part is that they go into detail on how to I and O your entire creative process, I'll be reading this section over and over again. Part 4 is a collection of success stories. I'll be honest, I haven't read this section yet as I've already listened to the I and O podcast with the live interviews of the same folks. Still, great group of writers. Anyway, that's all from me. I absolutely LOVED Iterate and Optimize!!! My only complaint is that I lost almost an entire night's sleep, bastards! A must read for SPP fans, and for any writer on the path.